The current Ebola crisis is a clear illustration that medical care is as much about good communication as it is about good medicine and good doctoring. “This illness is not just biological,” she reiterated. Ironically, the Ebola crisis has hit at a time when Southern has just developed a Social Science and Medicine minor that allows students to understand and appreciate the relationships between the broader medical field, society and culture, and human behavior. Students explore how human health is affected by, and contingent upon, both the culture of medicine and the socio-economic-political approach to illness and health. Pre-med and pre-dental majors in the new minor are learning “the importance of human skills to have successful outcomes,’’ Skoczen said. The Social Science and Medicine minor enhances the undergraduate education of students pursuing professional careers in the medical field (e.g., doctor, nurses), field of social work and public health, research careers related to medicine (e.g., sociology, history of medical, medical anthropology, environmental health) or business administration within health service. The learning objectives of the 18-credit minor include: investigating different approaches within the social sciences to the study of health, illness and medical systems; analyzing health care systems from an interdisciplinary and international perspective; and identifying the role of culture, economics and politics in the distribution, development, delivery and reception of health care and medical science. Students also learn to comprehend the complexity and variation of competing and/or supplemental medical systems; evaluate individuals’ responses and responsibilities to health and illness issues; and understand the integrated and complex relationship between medicine and social/cultural factors including: age, gender, race/ethnicity, and socio-economic status. Because the curricula helps students recognize the relationships between the broader medical field, society and culture, and human behavior – “it just makes sense for someone majoring in an area with medicine as a focus to choose courses in the Social Science and Medicine program,’’ Skoczen said. 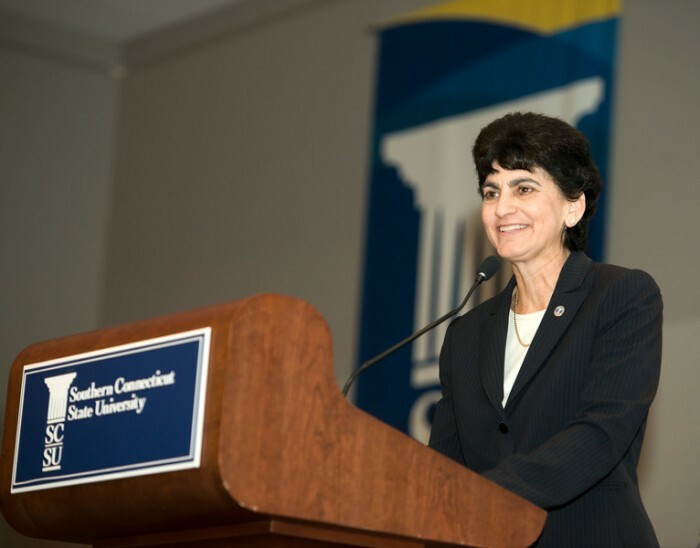 President Mary A. Papazian spoke on Oct. 29 at the Connecticut Women’s Hall of Fame’s 21st annual Induction Ceremony & Celebration: “Shaping our World: Women in Design & Innovation,” held at the Connecticut Convention Center in Hartford. The event honored this year’s inductees into the Hall of Fame: Jennifer Lawton, innovative entrepreneur, technologist and pioneer in the 3D printing industry; Marian Salzman, thought leader in public relations, among the world’s top five trendspotters; and Beatrix Farrand (1872-1959), nationally renowned landscape architect (and niece of American author Edith Wharton). The Connecticut Women’s Hall of Fame, hosted on Southern’s campus, is an educational outreach organization whose mission is to honor publicly the achievement of Connecticut women, preserve their stories, educate the public and inspire the continued achievements of women and girls. Founded in Hartford in 1994, the Hall fills the void that traditional curricula still fail to address and, today, stands as the state’s premier source for Connecticut women’s history with more than a hundred Inductees. These women’s lives and accomplishments are celebrated and documented through a wide spectrum of innovative statewide programs offered free of charge to Connecticut citizens. In 2008, the Hall formed a partnership with the university and moved to its campus. This collaboration allows the Hall to work closely with the SCSU Women’s Studies Program and Women’s Center, as it partners with many New Haven area organizations while maintaining its existing statewide relationships. Congratulations to the Hall of Fame and its staff on staging a memorable event this evening. And let’s have one final round of applause for the group of remarkable women that have been honored at this induction ceremony. Leaders in technology, public relations, and landscape architecture, our three inductees are a testament to the strength of women’s empowerment and education. And their individual legacies of achievement will continue to make a profound difference for years to come. Southern Connecticut State University is proud to host the Connecticut Women’s Hall of Fame – an educational outreach organization that honors the accomplishments of outstanding Connecticut women, and in doing so inspires new generations of young women and girls to follow in their footsteps. …as we provide opportunities for young women – and young men – to further themselves educationally, inspire them to achieve, and encourage them to work within the social and political arenas to see that all are given a fair chance. One of our latest areas of growth is in the STEM disciplines – fields in which women have traditionally been underrepresented. Despite the existence of Title IX legislation, it’s a fact that women still lag behind men in earning doctoral and professional degrees, particularly in nontraditional disciplines like math and science. Women have earned only about 20 percent of the doctorates in computer science, engineering and physics, which means that they are not involved in large numbers in the emerging computer science fields. In fact, not too long ago, it was widely held that girls didn’t like math and science and therefore couldn’t possibly be good at those subjects. Girls were sometimes steered away from higher-level classes in the sciences, and discouraged from joining math and science clubs. But as we know, high school girls now take the upper-level math and science courses required for math and science college majors at the same rate as boys. And at Southern, we educate future female scientists and engineers, along with teachers, nurses, businesswomen, journalists, artists, doctors, and individuals in scores of other occupations. In recent years, our enrollment in STEM courses has grown by more than 20 percent as we develop new programs in workforce-demand fields such as applied physics, chemistry and nanotechnology. As you may know, next spring we will open a $49-million academic and laboratory science building, which will provide myriad new opportunities for student learning and research. The four-story structure will feature teaching and research labs for physics, earth science, environmental science, molecular biology and chemistry. It will include a supercomputing lab, a saltwater aquaria room, an analytics lab for testing levels of mercury and other contaminants and the state’s first center dedicated to the cutting-edge field of nanotechnology. We plan to use the new building as a launching pad to build new community partnerships and establish Southern as a regional leader in the sciences. Our new Dean of the School of Education, Stephen Hegedus, is an innovative leader in STEM education and curricular development. 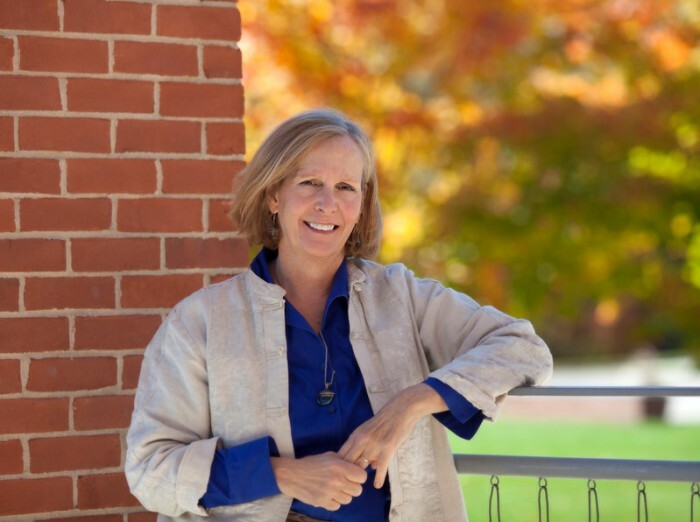 And Christine Broadbridge, one of Connecticut’s leading researchers in the fields of nanotechnology and materials science, is our new director of STEM initiatives. You may recall that she was an academic honoree at this event – celebrating women’s achievements in science – back in 2008. In her new role, Christine will be developing new programs on campus and building partnerships with governmental, business and other academic organizations. These ventures are important, as it is critical that our academic programming evolves apace with the new demands of our economy. For we all know that as the economy becomes more technology- and knowledge-based, the level of education that people will need will inevitably rise as a result. And so the workforce we must develop now must by necessity be creative, innovative, entrepreneurial and able to learn and imagine. At Southern, we look to build on these opportunities, partnering with the Connecticut Women’s Hall of Fame to ensure that all young women realize their full potential and join the ranks of those we have honored here this evening. Statistically speaking, Quintin Robinson should have been an academic failure. As a black male growing up in a single-parent home in rough-and-tumble Compton, Calif., just south of Los Angeles, Robinson had many of the well-known risk factors stacked against him. He gives much of the credit for beating the odds to his mother. “My father died when I was really young and my mother raised all six of us. She really pushed education and she pushed doing things for yourself,” says Robinson, the newest faculty member in Southern’s Educational Leadership Department. Robinson’s own life experience fueled his decision to focus his research on African-American males who were thriving academically, despite attending “failing” inner-city schools and living in homes with an absent father. Specifically, he wanted to examine the role their mothers played in their sons’ success. In every case, he found one common denominator: a mother who relentlessly pushed her son to achieve. His findings were published in the November 2013 edition of Multicultural Perspectives, the journal of the National Association for Multicultural Education. A record four in 10 births in the United States in 2008 were to unmarried women, up from 28 percent in 1990, according to U.S. Census figures. Of those, African-American women had the highest share of births to unwed mothers, at 72 percent. While research shows children in single-parent homes are more likely to live in poverty and do poorly in school, Robinson says his research suggests that investments in parental education and parent engagement programs can mitigate those disadvantages. “If these mothers were doing such a great job with these boys with no tools at all, then imagine what we could do if we started to really educate these mothers?” he asked. 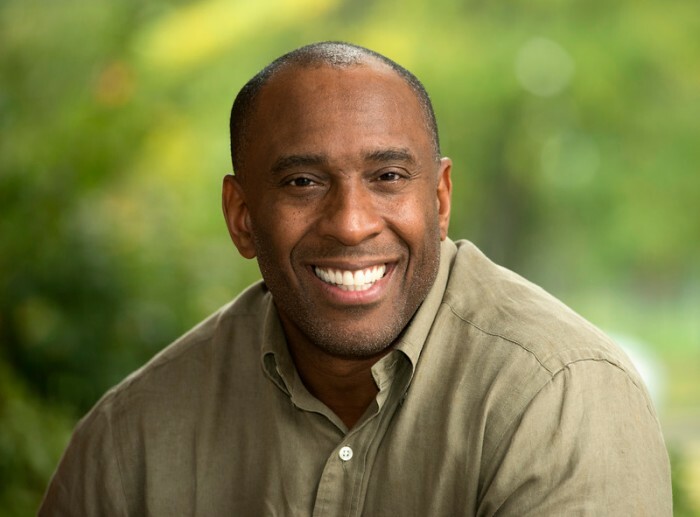 Robinson, an associate professor in educational leadership and policy studies, had always been interested in the achievement gap between African-American males and their white peers. But rather than add to the piles of research that already existed about the reasons for the academic failures of black men, he wanted to find out why some managed to succeed despite overwhelming obstacles. He did his initial research in the Los Angeles Unified School District, visiting two failing schools in the throes of state takeovers to look for case studies. His sought out male students with at least a 3.0 GPA who were living with their birth mothers in homes that lacked the presence of an adult male for at least four years before the study. Mothers who were college graduates were excluded from the study. Rather than using school-driven techniques to motivate their sons, the mothers used whatever methods they thought might work. One mom threatened to take away football – her son’s passion – if his grades slipped; another sought to influence her son through church. What surprised Robinson most was the mothers’ craving for guidance and advice. Because the mothers in the study lacked formal education, many said they felt intimidated by school officials or uncomfortable approaching school officials on their own, and felt educators were sometimes dismissive of their concerns. Senior geography majors Michelle Ritchie and Fatima Cecunjanin won the student poster competition at the New England-Saint Lawrence Valley Geographical Society’s (NESTVAL) annual meeting, held at at the University of New Hampshire on Oct. 24-25. NESTVAL is the oldest regional professional geographic organization, dating to 1922, and draws geographers from around the region to discuss cutting-edge research and advancements in the field. Ritchie and Cecunjanin presented their research entitled “Preparing for the Next Sandy: Coastal Resilience and Beach Stability Studies along the Connecticut Shoreline.” In addition to a monetary prize, they have been invited to publish their work in the journal Northeastern Geographer. Ritchie and Cecunjanin have worked closely with Southern faculty James Tait (environmental studies) and Patrick Heidkamp (geography) over the course of their studies. Their research detailing the relationship between beach width and hurricane damage garnered them a first-place finish in a competitive field of both undergraduate and graduate scholars. John also was interviewed on Oct. 16 about the Ebola situation on Channel 8’s 5:30 p.m. newscast. He was interviewed by health reporter Jocelyn Maminta during the 5:30 p.m. news program. *Kathleen Skoczen, chairwoman of the Anthropology Department, wrote an op-ed piece that was published Monday in the New Haven Register about the Ebola situation. She addressed it from a cultural anthropological situation and stressed the importance of taking a sophisticated approach when addressing the epidemic. *Mia Brownell, professor of art, was the focus on an Oct. 15 article today in the Hartford Courant. Her artwork, titled “Delightful, Delicious, Disgusting,” is being featured in a solo show at the Housatonic Museum of Art in Bridgeport. the 5th Congressional District campaign. *Three TV stations covered the Oct. 14 celebration to honor Anabel Gosseline, a freshman who was being granted her wish by the Make-A-Wish Foundation of Connecticut. Her wish was to have help paying her tuition so that she could go to school at Southern. She was honored by President Mary Papazian, as well as her teachers, staff members and students. In addition to being granted tuition help, she received gifts from campus organizations and had her favorite cake and cookies. Channel 30, Channel 61 and Channel 3 covered the event and aired their stories on Oct. 14. *The Meriden Record-Journal ran an Oct. 11 article on an award recently earned by President Mary A. Papazian from the Greater New Haven and Quinnipiac chambers of commerce. She received the Athena Leadership Award, an annual award recognizing a woman who strives toward the highest levels of personal and professional accomplishment, excels in their chosen field, devotes time and energy to their community in a meaningful way and forges paths of leadership for other women to follow. *The forum, “Election 2014: Polls, Pundits & Popcorn,” has generated considerable media coverage. The event, held on Monday, attracted about 250 people – including 130 high school students from six area high schools – Amity, West Haven, Hillhouse, Seymour, Cheshire and East Haven. The program provided an analysis of the upcoming midterm and gubernatorial elections, looking at polls, TV ads, historical data and other information. The Connecticut Post ran a story in the Oct. 7 paper. The CTNewsJunkie publication posted a story on Oct. 6. Several radio interviews and one podcast interview also were conducted in relation to the forum and promoted the event. WDRC (1360 AM) and its sister stations WMMW (1470 AM), WCCO (1240 AM) and WSNG (610 AM) conducted two interviews related to the forum on Oct. 4, including one with Art Paulson, chairman of the Political Science Department. WATR radio (1320 AM) interviewed Art on Oct. 3. CTTalking, a political website, posted a podcast about the event as a result of an interview on Sept. 25. 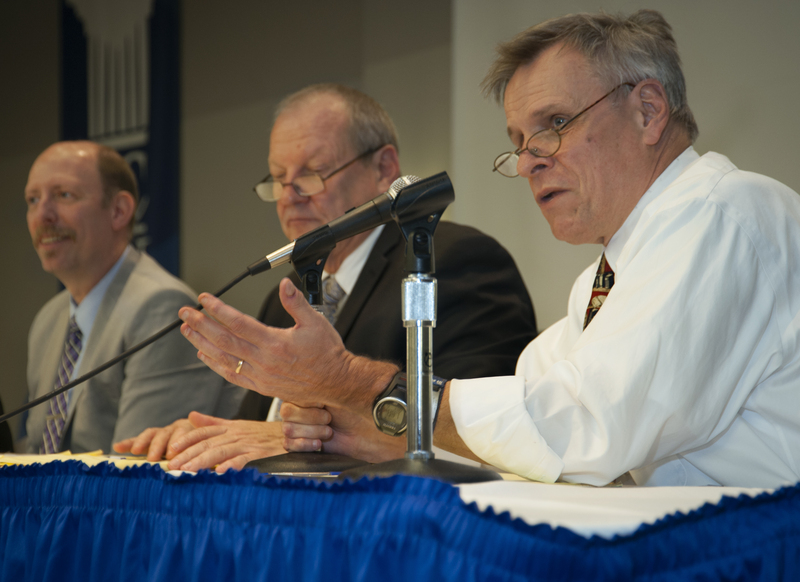 The Amity Observer posted a preview of the forum on its website on Oct. 3. The Fairfield County Business Journal ran an advance on the program in its Sept. 22 edition. Both Channel 61 and WTIC radio (1080 AM) interviewed Art Paulson about the upcoming elections, but did not refer specially to the forum. The best treatment for running injuries is to prevent them from happening in the first place. And while proper warmups, strength training and a stretching routine certainly help, some runners are more vulnerable to certain types of injuries. The problem is: they don’t always know about those inherent vulnerabilities until an injury already has occurred. But Southern’s Human Performance Lab recently acquired a state-of-the-art piece of equipment that can provide runners with the data they need to reduce the chances of repetitive stress injuries. 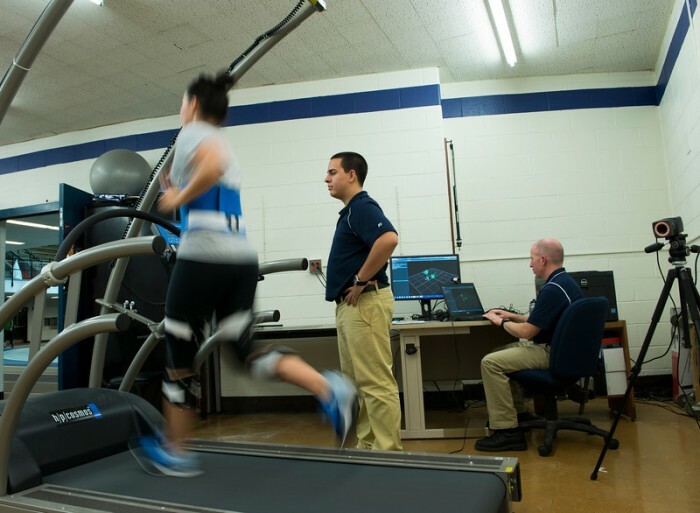 It’s a treadmill that uses cameras and technology to provide a three-dimensional gait analysis. The equipment shows a runner’s form and the flaws that may be emanating from their gait – whether it be a knee that rotates internally too far; a foot that pronates with too much velocity; or a hip that isn’t lining up quite the way it should. Gregory says that while Southern does not currently offer physical therapy, the new equipment provides the data that can be taken with them when consulting with a therapist, trainer or doctor. He says individuals will receive an overall injury risk score, as well as component scores evaluating a person’s ankle, knee and hip. For purposes of this test, the higher the score on a scale of 1-100, the less likely a repetitive motion injury may occur. Southern was able to pay for the equipment, totaling about $135,000, through a state bond issue. Gregory notes that while a person’s gait is not identical on a treadmill as compared with running on a road, trail, or track, it is usually very similar. “It’s close enough where we can make a very accurate evaluation,” he says. An evaluation generally takes only about 30 to 35 minutes. “It takes about 10 minutes for preparation, 10 minutes of questions, 3 to 5 minutes of walking, 3 to 5 minutes of running, and then a few minute to remove measuring devices from an individual,” Gregory says. The cost for a member of the general public to have the analysis conducted is $150, which Gregory says is generally less expensive than to have the test done in Boston or New York City. Faculty and staff can have the test done for $75, while a student can have it done for $25. Those who are willing to have their results included in a research database may have some or all of the costs waived, although the process takes a little longer with a 15 to 20 minutes or running assessed at various speeds. Gregory is hopeful that assessments may begin in November. For further information, contact Gregory at (203) 392-6036 or at gregoryr3@southernct.edu . As the CDC continues to monitor and respond to the recent ebola concerns, please be assured that SCSU is remaining informed through local and state health authorities. We currently have no university-sponsored trips where students or faculty are coming to campus from the affected areas. There are no university-sponsored study abroad trips in the affected areas. Any students that require medical care for any reason are being properly screened for travel history and symptoms of concern. We have no reason to believe that our campus community has any heightened reason for alarm. Since we are beginning to enter the season for other illnesses such as influenza, the usual methods to prevent infection remain important including handwashing. However, the ebola virus cannot be transmitted through the air, through water or through food. It can only be transmitted through fluids of an infected person or from exposure to contaminated objects – such as needles. Body fluids include blood, sweat, urine, feces, saliva and possibly nasal secretions if close to the infected person. Any person with recent international travel to affected areas separate from university-sponsored travel should monitor their health status for three weeks after arrival from West Africa. Taking your temperature once or twice daily might be helpful. If you have traveled to West Africa and develop sudden fever, chills, muscle aches, severe diarrhea, vomiting, rash or other symptoms consistent with Ebola, you should seek immediate medical attention. When traveling to a health-care provider, limit contact with other people and avoid all other travel. Maintain good healthy practices like getting plenty of sleep, maintaining good nutrition, drinking plenty of water and increasing your physical activity to help your immune system best resist infections. SCSU is committed to ensuring the health and wellness of our community and will keep you updated in the event of any changes. If given the opportunity to be granted just one wish, many people would choose money, fame or power. And even if that wish were limited to something tangible, many would opt for a car, meeting someone famous or taking a long vacation to their favorite destination. When freshman Anabel Gosseline was posed that question, she chose a different option. She asked to have help in paying her college tuition. And the Make-A-Wish Foundation of Connecticut made that wish come true. “I chose education because to be successful in life, it is so important to have a degree,” Gosseline says. A ceremony in her honor was recently held in the Michael J. Adanti Student Center Resource Room, which took place the day before her 19th birthday. Gosseline was diagnosed with a form of brain cancer in June 2013, around the time that she was graduating from Stratford High School. It has been a long road, but she is doing considerably better now. In fact, she originally had hoped to begin taking college classes in January. But her doctor cleared her to begin this fall on a part-time basis. She is currently taking three classes, and hopes to go to school full time starting in January. Gosseline says that she would like to pursue a career in oncology pharmacology. “I really would like to give back for the help that I’ve gotten, especially during the last year,” she says. Among those who greeted her were members of Southern’s Omega Zeta Pi sorority, which is a service-based organization that is affiliated with the Make-a-Wish Foundation; Chelsea Harry, assistant professor of philosophy, and Dawn Cathey, who teaches an Inquiry course — both of whom teach Gosseline. Harry and Cathey point out their classes have a service theme to them, and that Gosseline has led an effort to write cards to young children who are cancer patients at Yale-New Haven Hospital’s Smilow Center. “She is every professor’s dream student,” Harry says. 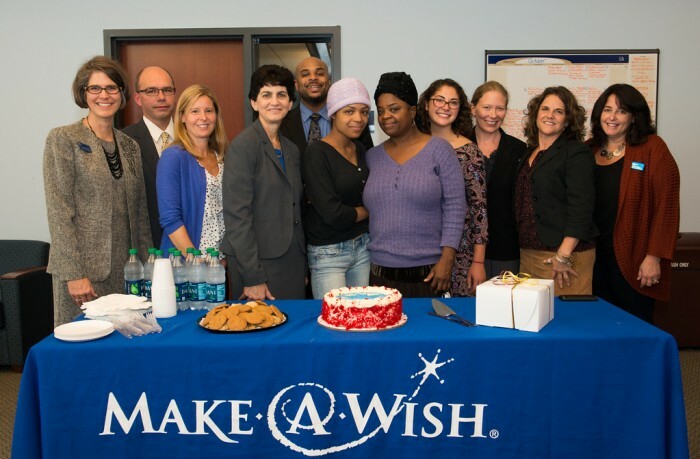 Debbie Artinian, wish manager for the Make-A-Wish Foundation of Connecticut, presented Gosseline with several gifts from her organization, including a crepe velvet cake and chocolate chip cookies, which are her favorites. Note: The “wish” ceremony for Anabel Gosseline was covered by Channel 30, Channel 61 and Channel 3. Mary A. Papazian, president of Southern Connecticut State University, received the 2014 Athena Leadership Award during an Oct. 9 luncheon at the Toyota presents Oakdale Theatre in Wallingford. Papazian has enjoyed a notable career as an educator, administrator and scholar of English literature. Appointed as the university’s 11th president in December, 2011, she oversees an institution of almost 11,000 students, 434 full-time faculty, 1,100 staff and an operating budget of $190 million. Her first day at Southern was Feb. 1, 2012, and since then she has led a period of institutional enhancement. A major construction program is changing the face of campus. A new School of Business building has been followed by a major renovation and expansion of Buley Library and the construction of a new Academic Laboratory Science Building, scheduled for completion in spring, 2015. Addressing pressing issues of retention and graduation rates that are currently facing many public institutions of higher education, Papazian instituted a Student Success Taskforce to examine and improve key areas of enrollment management and create a clear path to a college degree. Curricular changes have also been introduced to meet workforce needs. In the sciences for example, there are new graduate-level offerings in applied physics, nanotechnology and chemistry – the latter featuring a professional science track for students seeking advanced training in both chemistry and business. Papazian has taken an active role in the community as a member of the New Haven Regional Leadership Council, vice-chair of the Greater New Haven Heart Walk and a director of New Haven Promise, a scholarship and support program created to promote college education as an aspiration for all New Haven Public School students. At the state level, she is the vice-chair of the Connecticut Campus Compact Board of Directors and was part of a delegation to Complete College America, a national conference that assists states to increase the numbers of students earning college degrees and to close attainment gaps between traditional and under-represented populations. 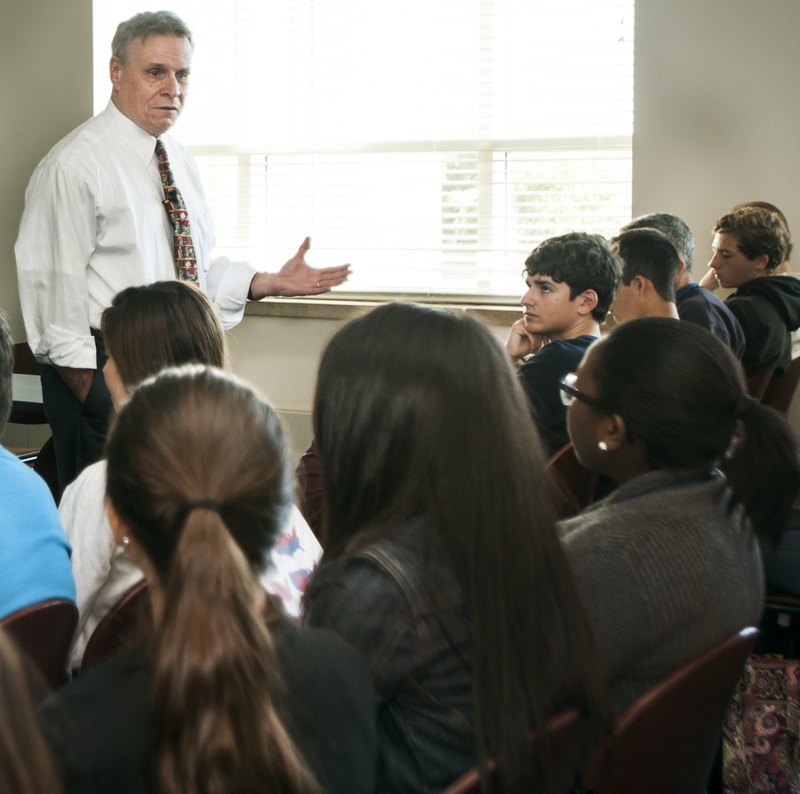 Nationally, Papazian is a member of the American Association of State Colleges and Universities (AASCU) Committee on Teacher Education and the Council for Accreditation of Educator Preparation (CAEP) Accreditation Commission. Prior to Southern, Papazian most recently served as provost and senior vice president for academic affairs at Lehman College in The Bronx, which is part of the City University of New York (CUNY) system. A professor of English, with a focus on the works of John Donne, an English poet who wrote during the Renaissance era, Papazian holds a Ph.D. in English literature from the University of California, Los Angeles (UCLA). 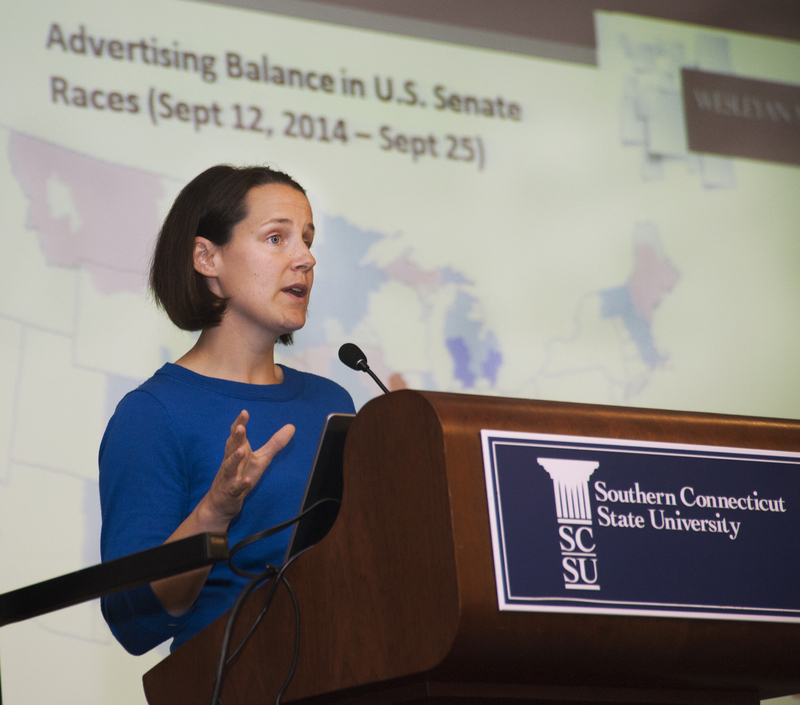 When the 250 individuals attending a recent forum at Southern that analyzed the 2014 gubernatorial and midterm Congressional elections were asked whether they had ever donated money to a political campaign, dozens of hands were raised. A similar number acknowledged that they had volunteered for a campaign. Ordinarily, the response may not have surprised too many people. After all, those who would come out at lunchtime to hear an analysis about the 2014 political landscape are probably political engaged. And those who are politically engaged are more likely to contribute to a campaign, either with money or time. But what made this an eye-opening moment was that more than half the crowd consisted of high school students. And it was clear that many of those kids were among those who hoisted their hands into the air at those two questions about political activism. 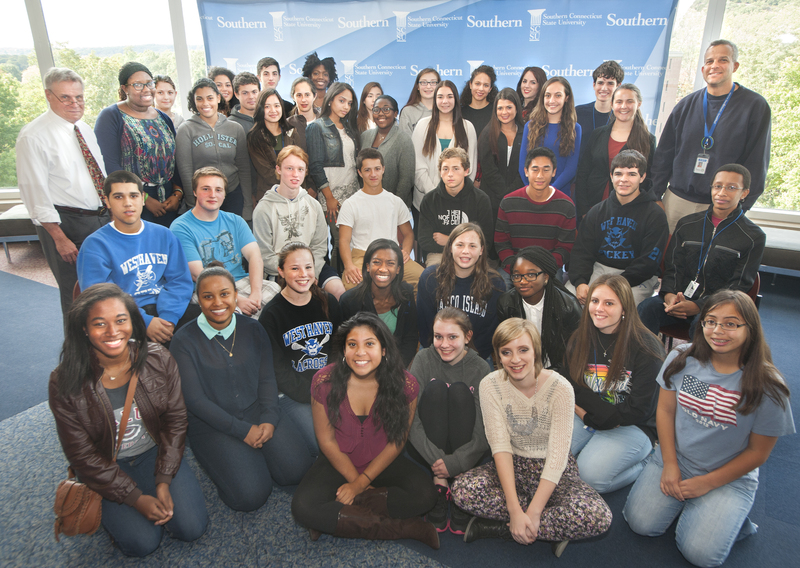 About 130 students – hailing from six high schools in the area (Amity of Woodbridge, Cheshire, East Haven, Hillhouse of New Haven, Seymour and West Haven) – attended the forum at Southern called, “Election 2014: Polls, Pundits & Popcorn.” Walking through Southern’s Grand Ballroom, you could see some of the high school students taking notes as the panel of speakers shared their analyses about the elections. 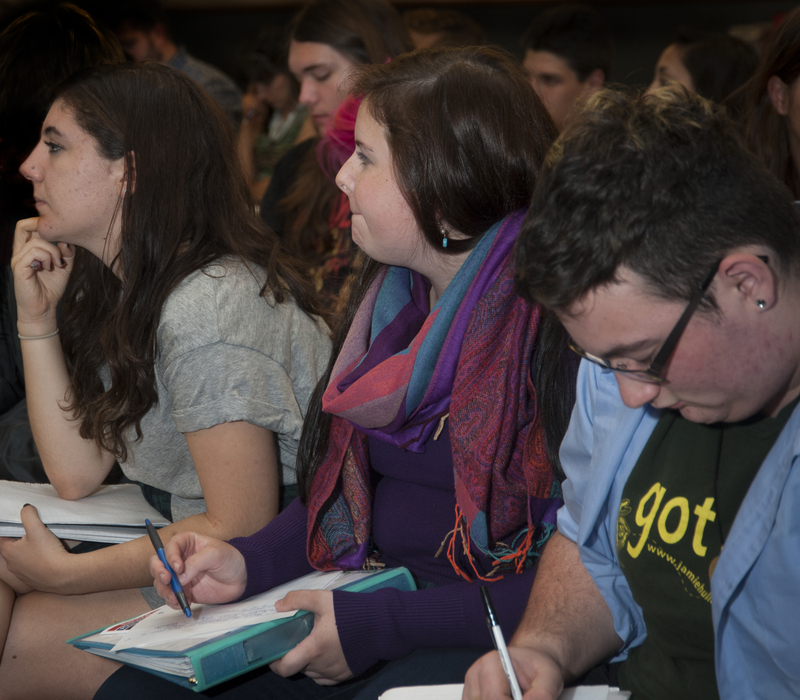 Amity High School students listen intently during the SCSU forum on the 2014 elections. While the students were generally those in honors or Advanced Placement (AP) social studies classes, it showed a real engagement of young people in the political process – a healthy sign for the future of our democracy. Cheshire High School, for example, has a Young Politicians Club, which includes students with a range of political views. 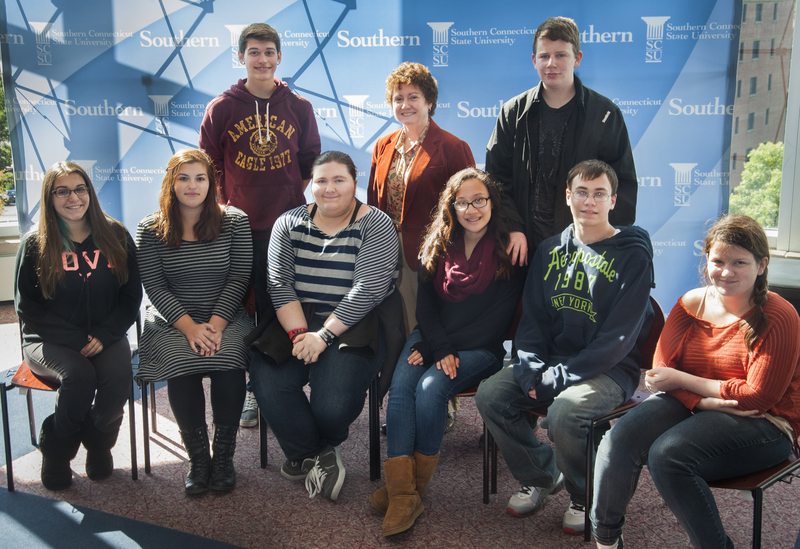 Most of the Cheshire High School students attending the SCSU forum are members of their school’s Young Politicians Club. 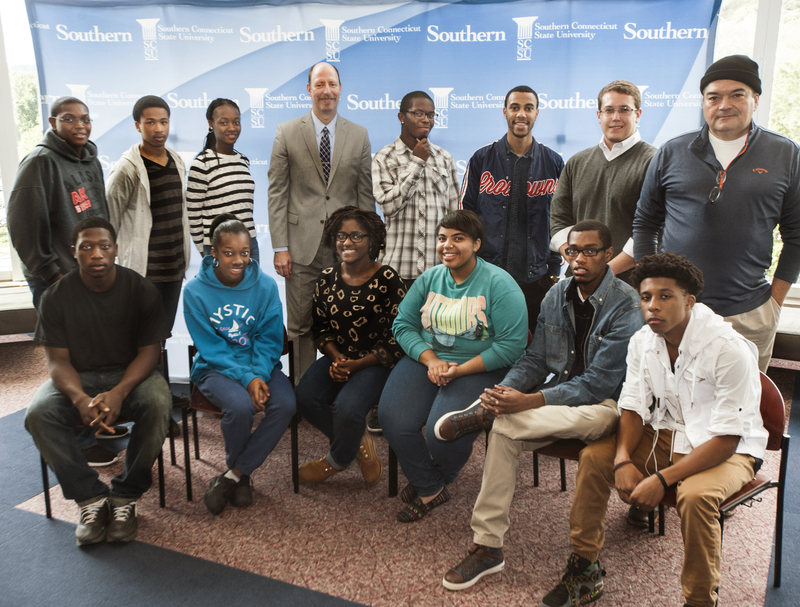 West Haven High School’s AP U.S. Government and Politics students were enthusiastic about attending a college lecture before the event taught by Art Paulson, chairman of Southern’s Political Science Department. Art Paulson, chairman of the SCSU Political Science Department, delivers a lecture on the history of midterm elections to advanced West Haven High School juniors. The talk came just before the start of the SCSU forum on the 2014 elections. The forum included a look at polls, TV ads, campaign strategies and some historical analysis of state and national elections. The event – a veritable summit of Connecticut’s political analysts – included Power Point presentations by Jennifer Dineen, director of the University of Connecticut poll, and Laura Baum, project manager of the Wesleyan Media Project. 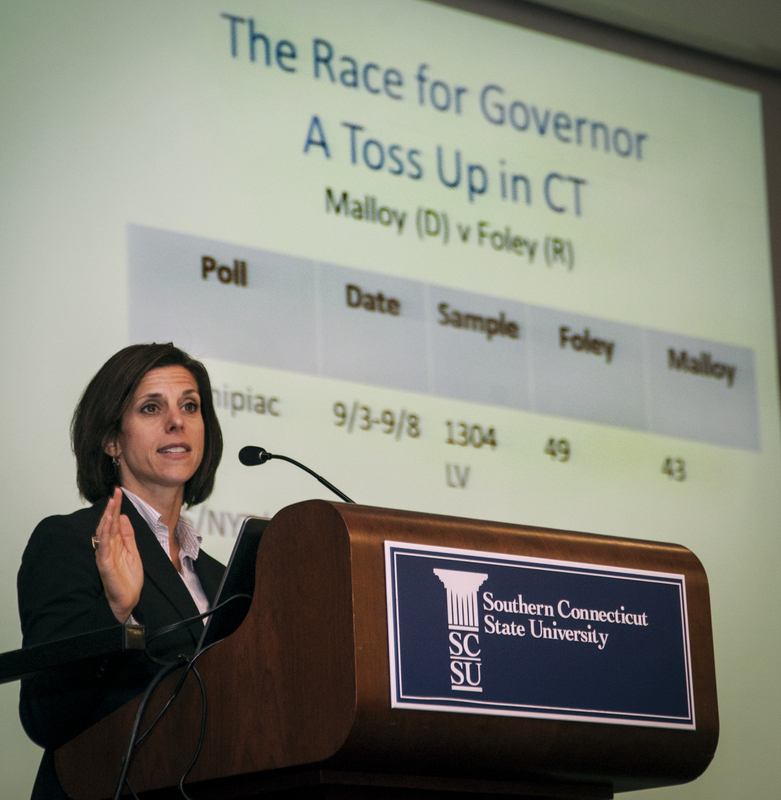 Jennifer Dineen, director of the UConn poll, analyzes the Connecticut gubernatorial race. Laura Baum, project manager for the Wesleyan Media Project, discusses the advertising ‘air wars’ between Democrats and Republicans in the battle for control of the U.S. Senate. Art Paulson makes a point during the panel discussion. Also pictured are: Scott McLean (left), professor of political science at Qunnipiac University, and Gary Rose, chairman of the Sacred Heart University Department of Government and Political Science. Christine Stuart, editor-in-chief of CTNewsJunkie, an online news publication that focuses on governmental and political stories, served as the moderator. 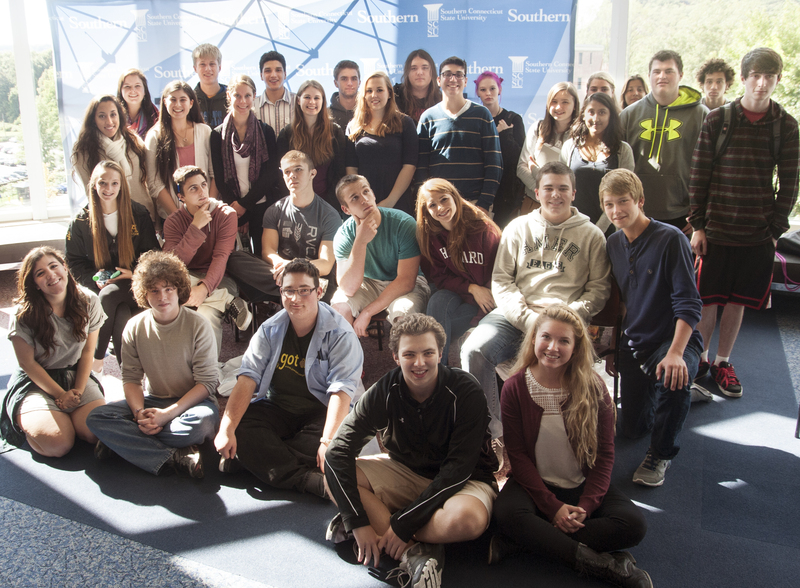 Seymour High School students pause for a moment outside the SCSU Grand Ballroom. Hillhouse High School students gather. East Haven High School students take a moment. Amity High School brings a large contingent of students. West Haven High School students swarm in the lobby before the event. The forum is available online via CT-N.